A group of hunters aboard a small boat out of the tiny Alaska village of Wainwright were the first to spot what would eventually be called “the blob.” It was a dark, floating mass stretching for miles through the Chukchi Sea, a frigid and relatively shallow expanse of Arctic Ocean water between Alaska’s northwest coast and the Russian Far East. The goo was fibrous, hairy. When it touched floating ice, it looked almost black. “We responded as if it were an oil product,” says Coast Guard Petty Officer Terry Hasenauer. 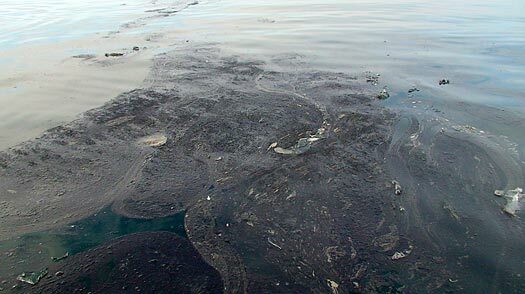 “It was described to us as an oil-like substance, thick and lingering below the surface of the water. Those characteristics can indicate heavy, degraded oil, maybe crude oil, or possibly an intermediate fuel oil.” Meanwhile, the story spread over the internet like an oil-spill, giving lots of people a queasy feeling. Test results released Thursday showed the blob wasn’t oil, but a plant  a massive bloom of algae. While that may seem less dangerous, a lot of people are still uneasy. It’s something the mostly Inupiat Eskimo residents along Alaska’s northern coast say they could never remember seeing before. So far in Alaska, nothing suggests the Chukchi Sea blob is toxic, although the Coast Guard’s Hasenauer said toxicity tests were planned. In any case, virtually no commercial seafood production comes from the waters along Alaska’s northern coast, but residents do fish, hunt whales and harvest other animals as part of a traditional subsistence lifestyle. In the meantime, the blob for the most part is staying away from the shoreline and slowly drifting farther and farther away.